A 24-hour Carrefour Express supermarket powered by vending machines will open in downtown Brussels early next year. The store, on Rue du Marché aux Peaux near the Grand-Place, will have no aisles or cashiers - but will still employ staff to keep the stock replenished and to bake fresh bread. Using a touch-screen, customers can fill their shopping basket from a range of about 400 everyday products, pay by card and collect their shopping from a hatch. Orders can also be placed online for collection. A Carrefour spokesman said the 24/7 experiment had "a lot a potential" - and could be extended to other busy locations in city centres or railway stations, where space is tight. "The goal is not to build a shop without staff," he added. "Employees will work behind the scenes to bake bread, replenish products and solve technical problems." Not exactly a new concept. There was an automated shop in Freiburg-Br back in the 1980's. Not a chain, just a single shop. It's still around today apparently. We have had a 24/7 Carrefour Express where we live for several years now. Staffed by real people too. So, where do you live silverflipper? 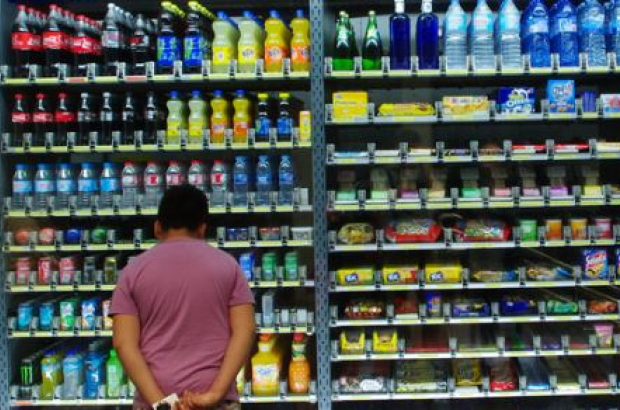 I just wonder how long it will take before the same happens as with AD Delhaize Bourse when they installed a similar “automatic night shop” a few years ago. But maybe Carrefour has bigger financial backing to pay the “pizzo”.